Tim Berrier won an Iowa high school state wrestling championship and received a wrestling scholarship to Iowa State University. He became a starter in his red shirt freshman season, but a season ending injury led to a transfer to the University of Arizona. He was a starter for the Wildcats in what was the final season that Arizona had a varsity wrestling program. Berrier spent his last two seasons of eligibility as an assistant coach at Catalina High School. 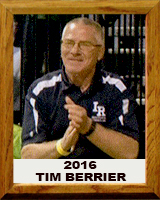 As of 2016, Berrier has coached 30 seasons—23 of them as a head coach at 3 different high schools in Tucson. He has led his teams to a 426-118-3 record. In the last 19 years, 16 of his teams have finished in the top 6 at the state tournament including 4 state championships, 3 runners-up and four 3rd places. He has coached 31 individual state champions and 22 runners-up among his 100+ state medalists. Berea has been a national coach for Team Arizona and has also been selected to coach the senior all-star meet several times. He has received the Southern Arizona coach of the year award 8 different times. He has been named state coach of the year 4 times by Wrestling USA magazine, 3 times by the National Wrestling Coaches Association and twice by the Arizona Republic. He has garnered national recognition by being named Regional (Western United States) coach of the year and being a finalist for national coach of the year by the National Wrestling Coaches Association and National High School Athletic Coaches Association. In 2016, he was named National Coach of the year by the National Federation of State High School Associations.